main audio program. Both are possible. ◊ Please read the safety instructions that appear at the end of this document. use the MA400, turn the MIC LEVEL and MON LEVEL controls to 0 (zero). disconnect the unit from the mains, pull out the main cord plug. As soon as the unit is connected to the mains, the ON LED is illuminated. audio cable that includes XLR connectors. ground connection to the mixer. includes ¼" connectors (unbalanced/stereo TRS or unbalanced/mono TS). MA400, use the ¼" or, alternatively the ⁄" PHONES connector. ◊ Do not simultaneously use both PHONES connectors. 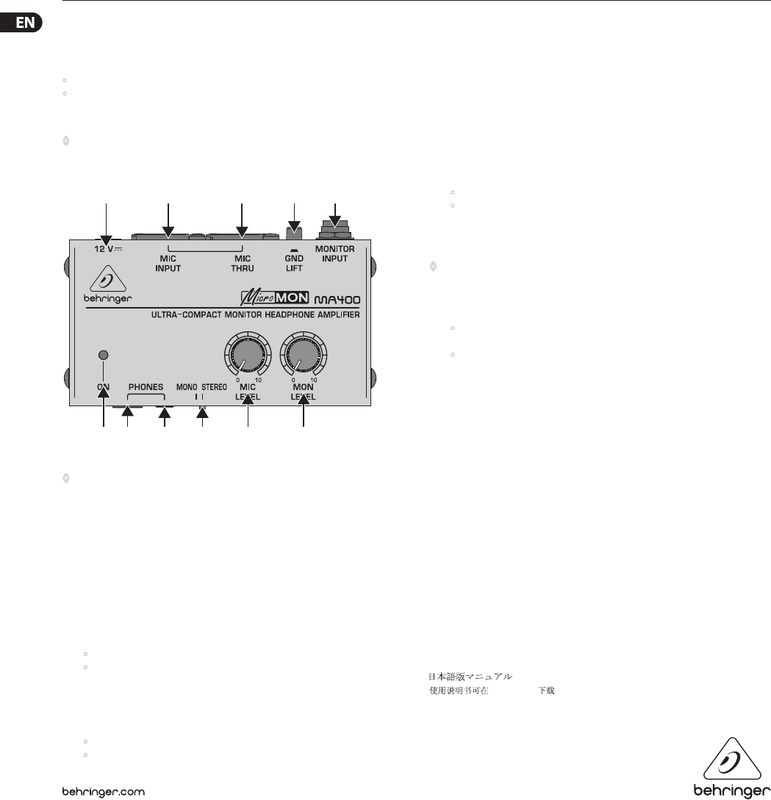 To specify the type of mixer or Hi-Fi signal the MA400 receives, use this switch. • a TRS connector into the MONITOR INPUT, the MA400 receives a stereo signal. Push this switch to STEREO. (minimum volume) or, alternatively 10 (maximum volume). For our current warranty terms, please refer to our website at http://behringer.com.